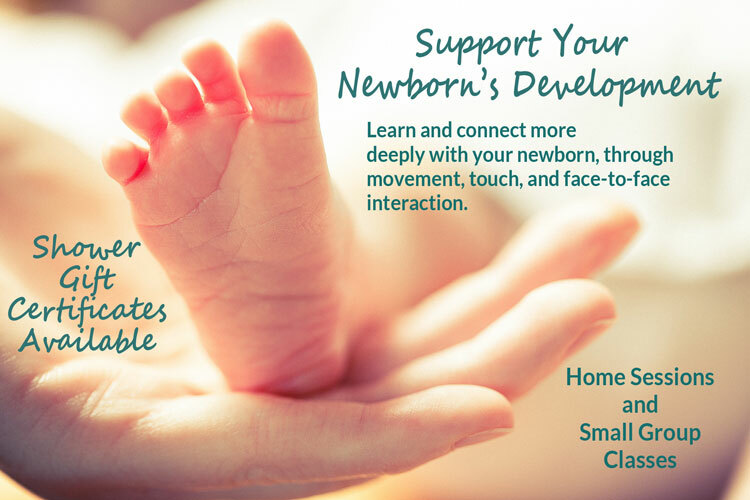 Support and Enrich Your Baby's Development. Victoria is now offering individual sessions and group classes in the Child’Space Method. One of the exciting aspects of Child’Space, in addition to working hands-on with babies and young children, is the aspect of parent education, helping parents and caregivers to learn through movement and touch how to support their child’s overall well-being. The classes Victoria offers are for parents with well babies as well as parents who have babies with special gifts and special needs. These semi-private classes benefit the babies and parents in many fruitful ways. The videos on this site and a phone call with Victoria will give you more specific information. NOTE For All Classes: Class size limited to 6 babies and moms (other caregivers welcome), please be sure to pre-register before the class you want fills up. For babies 0-5 weeks. Drop-in when you can! For babies 5 weeks to 5 months. In this joyful, gentle class, parents learn to support their baby’s development through touch and movement. After experiencing new movement patterns, babies find a wider range of movement than they might discover on their own, and become more comfortable in any positions and improve movement including tummy time and rolling over. Parents learn answers to their questions about their baby’s development and also, notice other positive changes in their babies after learning the Child’Space Method, such as reduction of colic, improved ability to self-soothe and improvements with feeding. Please bring a receiving blanket to lay your baby on for this class. Parents and caretakers bond as you learn to encourage the movements that are building blocks for balanced, coordinated sitting, crawling, standing, walking and more. Break up your daily routine with new ideas to use outside of the class, meet new parents and babies, and address questions or concerns you may have about your baby’s development. Call Victoria to arrange a small group class in your home. Victoria working with a physically-challenged young girl. Victoria began working with children with special needs when she was 19, in 1974. Her work included children with a wide variety of physical and mental challenges, and brain injuries. While not a comprehensive list, these children lived with diagnoses of cerebral palsy, muscular dystrophy, and developmental delays, as well as children and adults who were Deaf, blind, deaf-blind and sometimes, with multiple physical challenges as well. In 1978, when Victoria began to study directly with Dr. Moshe Feldenkrais, at age 23, she realized that this was the missing piece from her previous work. 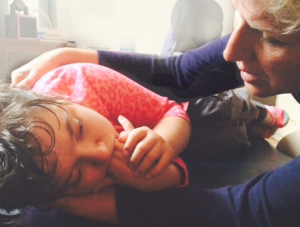 Victoria was helped to walk and move more freely through the Feldenkrais method, and she decided to bring this very unique sense of well being, increased mobility and hope to differently-abled people of all ages. She has continued her study, as well as her work directly, with babies, children and adults who face many challenges. 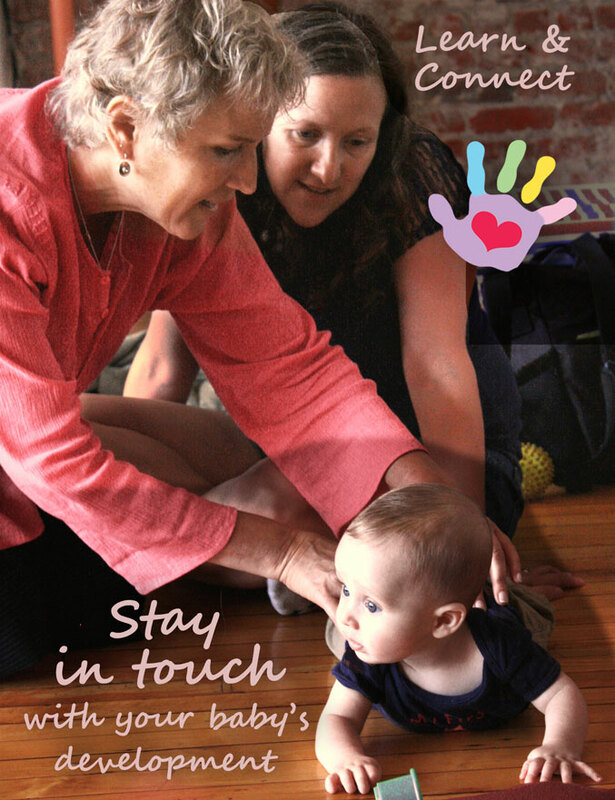 Over the almost four decades of her Feldenkrais practice, Victoria’s work has always included babies. And she went on to study further with various Feldenkrais teachers who specialize in working with babies and young children. Now Victoria is thrilled to share even more with families after completing a formal training studying directly with Dr. Chava Shelhav from Israel: Child’Space, The Chava Shelvav Method. Dr. Shelhav is the only Feldenkrais teacher, and the only one of Dr. Feldenkrais’ original students, who has written a Ph.D. on working with babies and children with various brain injuries, c.p., etc. Dr. Chava Shelhav received her masters at Boston University. Her thesis, Working with Brain Damaged Children Using the Feldenkrais Method, was published in 1989. Her doctorate is from the University of Heidelberg. Working in the Departments of Sociology and Life Sciences, her thesis examined the effects of the Feldenkrais Method on learning processes and other aspects of childhood. Child’Space moves with the Child’s Pace. Get more information or register for a lesson today.